The mother church of Preston’s Baptist Chapel was the Tilehouse Street Baptist Church (Salem) in Hitchin. This church was established in around 1670 as a result of John Bunyan’s open-air ministry in Hertfordshire. 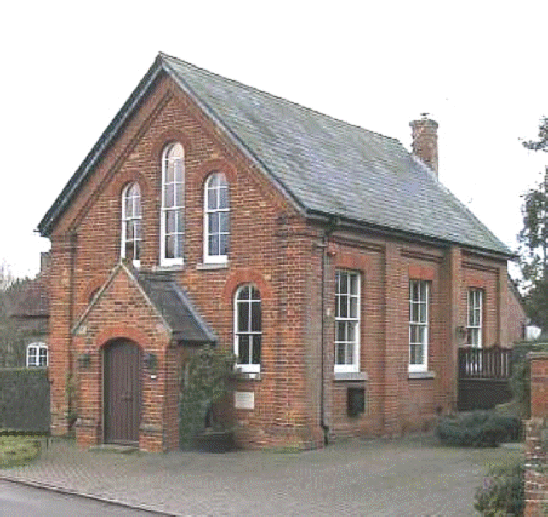 A meeting house was built at Hitchin in 1692. By the 1840s this was inadequate for the large congregation which was attracted and in 1844 the present Church was built. The Church set up ‘Mission Stations’ around Hitchin which were regularly visited by senior members and lay preachers. These stations met in private homes or barns. Some, like the congregation at Wymondley, grew strong enough to build a chapel for themselves. There were four news reports which featured Bunyan’s Chapel in the early 1880s. These indicated that it was well supported in its early days. In February 1882 there was a tea meeting on a Wednesday evening at the chapel which was attended by 150 villagers and friends. The addresses were given by Mr George Halsey and Mr J. Rennie, who was a familiar figure at Hitchin markets with his mobile stall loaded with religious tracts. The chapel’s Sunday School had eight teachers and 70 scholars. Two months later, on Easter Monday afternoon, the chapel’s social tea attracted so many (230) that the party had to be divided. The prevailing feeling of optimism resulted in the hope that the annual meetings at Bunyan’s Dell (which had been allowed to lapse) might be revived. The momentum of encouraging attendances at the chapel was maintained as, at the anniversary services in June of 1882, so many were in attendance (300) that the evening service was held on Preston Green. Mr Cole of Luton and Mrs Cobb of London were the preachers and Miss Marriott of Preston presided at the harmonium. The collection and proceeds from the tea raised £11 and it was noted that the Sunday School now had 12 teachers and 90 students. Two years later, at the chapel’s anniversary service of 1884 there were still 200 present for the public tea and the collection raised seven guineas. In view of Preston’s place in the Bunyan tradition and also the strength of feeling for the faith in the village - in 1886 about half of the village population claimed to be Baptist - in around 1875, following the establishment of a Baptist Sunday School, there was a move to build a more substantial chapel in Preston. A piece of ground was generously offered for the chapel but on careful consideration this was found to be too remote from the village. The scheme had therefore to be postponed until, after many unsuccessful efforts, a cottage with a garden on which a cottage could be built was purchased for £100 in the very heart of the village. It was ‘a happy thought of the well-known and much esteemed Michael Foster of Huntingdon to raise a fund for the chapel from the members of the Foster family as an expression of their gratitude to God for his goodness to them and as a memorial of the connection of their ancestors with Bunyan. It was a matter of general regret that feeble health prevented him from taking part in the services then although it was hoped that he might be able to attendthe opening services during the summer of 1877’. On Thursday April 5 1877, the memorial stones were laid at three o’clock. A ‘goodly company’ gathered around the building. After singing an the reading from the scriptures and prayer by the Rev SB Driver (Independent Minister of Hitchin) the pastor introduced the gentlemen who were to lay the stones to the company viz Messrs Edmond and J foster of Cambridge and handed them the trowels. After a few appropriate words they duly laid the stones which bore the following inscriptions: ‘This stone was laid by Edmond Foster Esq of Cambridge April 5, 1877’ and ‘An Ebeneezer of the Foster family whose ancestors were associated with Preston and Bunyan’. The Rev JH Millard offered prayer and the Rev J Brown Minister of Bunyan Meeting, Bedford, spoke. After offerings had been laid on the stones, the company dispersed. 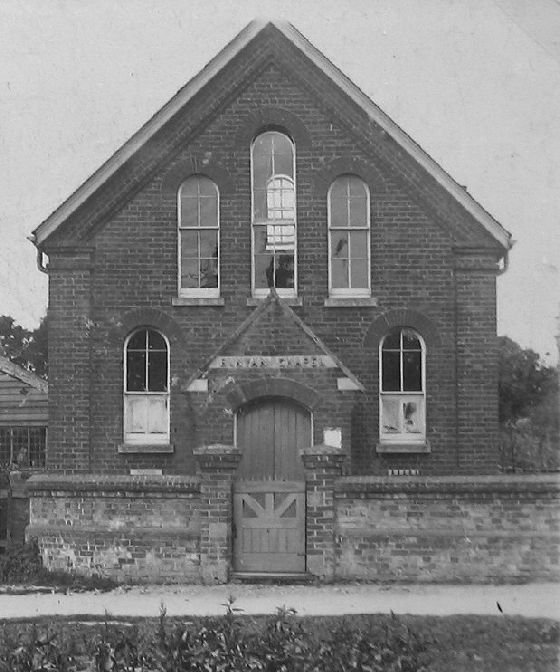 Later, at Tilehouse Street Schoolroom, details of the chapel building project were given. The total cost was estimated at £450, towards which the Foster Fund contributed £120; friends from a distance collected by the pastor £74; friends in Hitchin not connected with the congregation, £45; proceeds from the day, about £20. These amounts left little more than £100 to be subscribed. At the end the Chairman said that if the Chapel could be opened debt-free, he would give another £20. Donations were to be sent to the treasurer, Mr M H Foster of Wymondley. At the end of the nineteenth century, the three sisters who ran the Post Office - the Misses Frost and Mrs Brown - were ‘main stays’ of the chapel, providing teas for the visiting lay preachers. Religious apathy and the cost of building repairs (‘the floor was a bit dicey’) resulted in the closure of the chapel in 1987 By then there were just four or five faithful souls in the congregation and the Sunday School had also declined although 11 attenders were from one family, the Browns. The closing service was held on Sunday 9 August 1987. Ministers and friends from Tilehouse Street and Wymondley attended the service including Mollie Foster who maintained the link with the Foster family of the seventeenth century. 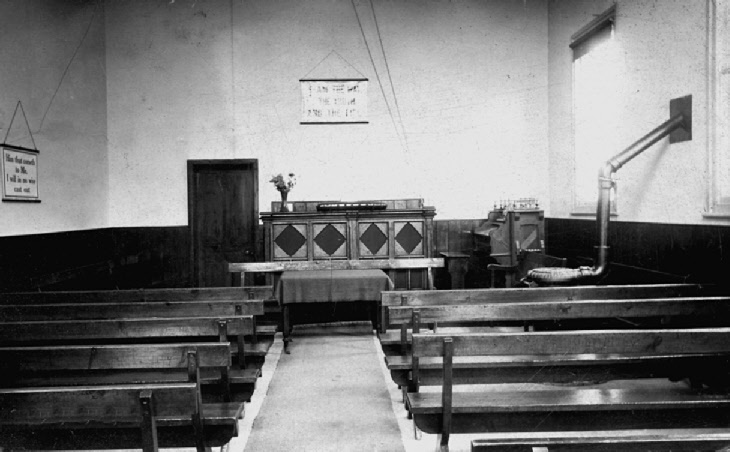 Bunyan’s Chapel had been used as a place of worship in Preston for a century. Following Bunyan’s secret ministry and the Declaration of Indulgence in 1672, the first overt nonconformist meeting was held in Preston in the cottage Widow, Heath. 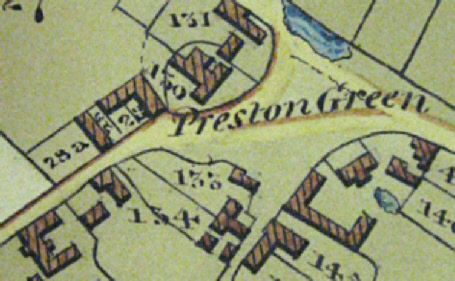 In the nineteenth century, the station met in a barn (circled below) at the rear of a tailor’s shop at Preston Green. For many years services were regularly conducted by preachers connected with Tilehouse Church in this shed converted into a rude chapel for which a yearly rent is paid (the ‘tin barn’ was demolished in the 1960s).